I have said previously that at first glance Ikebana does not seem to be a competitive discipline. Competition in Ikebana tends to occur in informal ways, which some may find hard to deal with. Another characteristic I would like to focus on now is the fact that Ikebana is not compatible with today’s business world. This may be a factor in the decline in the popularity of Ikebana. If you finish a course in the Western floristry, you can use that qualification to work for a florist or to start your own business. However, there are very few opportunities for those who have completed an Ikebana course. Ikebana is not interested in the needs of the market. This is not necessarily a bad thing. I just want to clarify what Ikebana is. To better understand this aspect of Ikebana, we need to look into the historical development of Japanese art. There are two main streams in Japanese art forms: misemono (show) and yugei (hobby art). The former includes dance and kabuki. Professionals perform to meet the clients’ needs. This form of show business is very popular all over the world today. The second stream may be a bit harder to understand because it has some uniquely Japanese aspects. Basically it is a hobby for wealthy amateurs. It requires hard training to achieve a certain level of art, which may not necessarily be appreciated by the public. It is often regarded as a kind of spiritual training and has developed under the iemoto system. The interesting thing is its unique financial system. In the next issue, I’ll discuss the financial aspect of Ikebana that is based on the same system as yugei, and how this feature of Ikebana is the major factor that makes it hard for Ikebana to adjust to the contemporary capitalistic world. These are table arrangements I made for Ms Renouf. 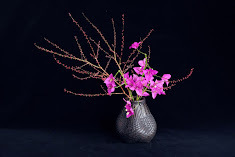 This is a Western arrangement using Ikebana principles. My clients often request flowers that I have never thought to use for my own works. That is a challenging and interesting aspect of making commercial works. I used oasis to fix red earthy colored roses and wax flowers.